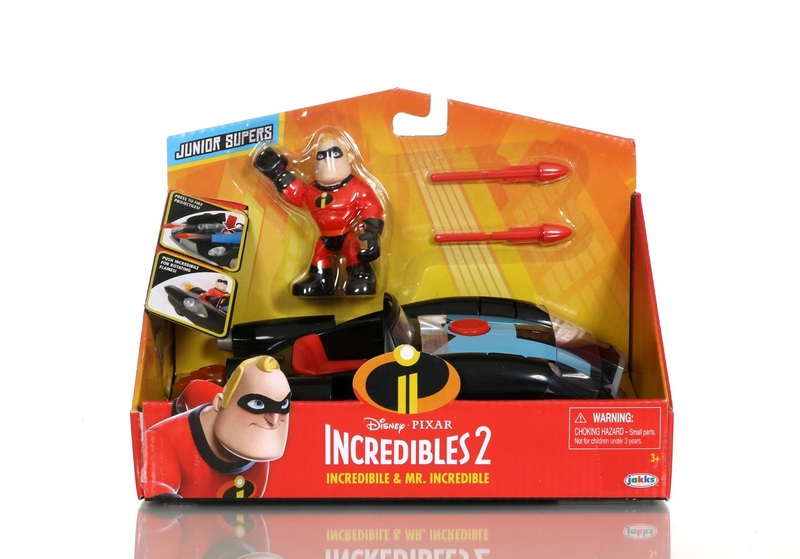 I've been having a blast this week reviewing Jakks Pacific's Incredibles 2 "Juniors Supers" collection! If you missed my previous posts, you'll definitely want to catch up before moving on here (see my detailed reviews of the Underminer's Tunneler Playset and the Figure 2-Packs). OK ready? 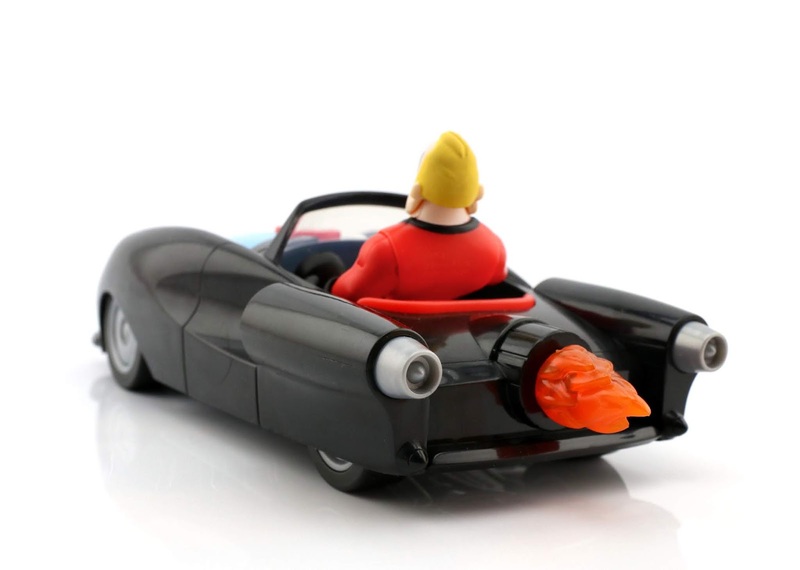 Tonight I'm taking a look at two of the smaller scale vehicles—the Incredibile (with Mr. 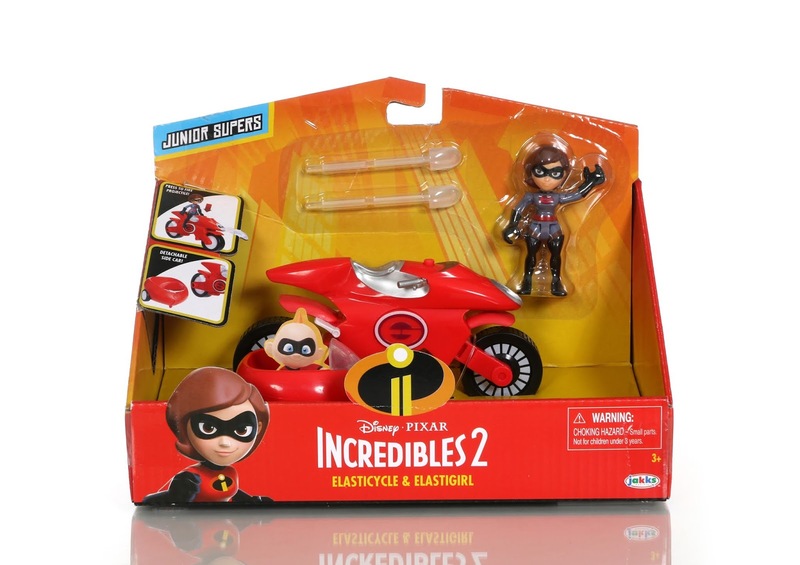 Incredible) and the Elasticycle (with Elastigirl)! 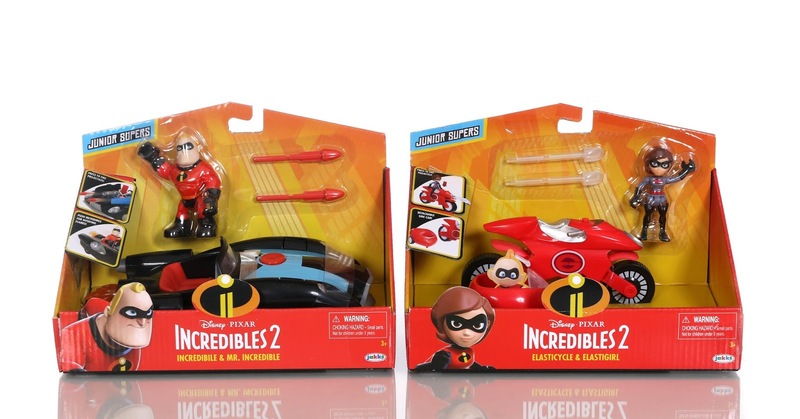 Like with the Tunneler Playset, these bring a lot of additional play value to the Junior Supers line. These vehicles may be small, but they pack a lot of action and fun. Take Mr. 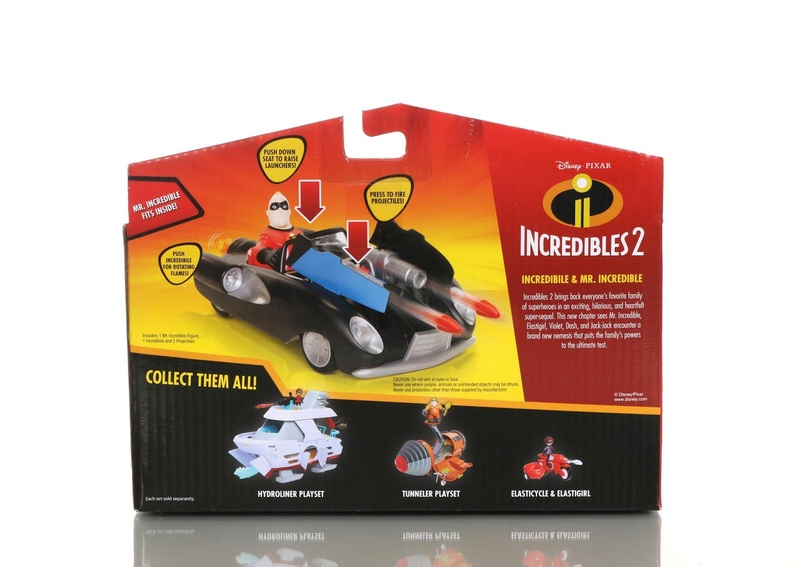 Incredible's Incredibile for example...it has spinning exhaust flames AND pop-up spring loaded missile launchers! Take a closer look at these awesome toys below. Roll the vehicle along a flat, hard surface to activate the spinning flames. Such a nice touch! To raise the launchers, just press down on the Incredibile's seat. 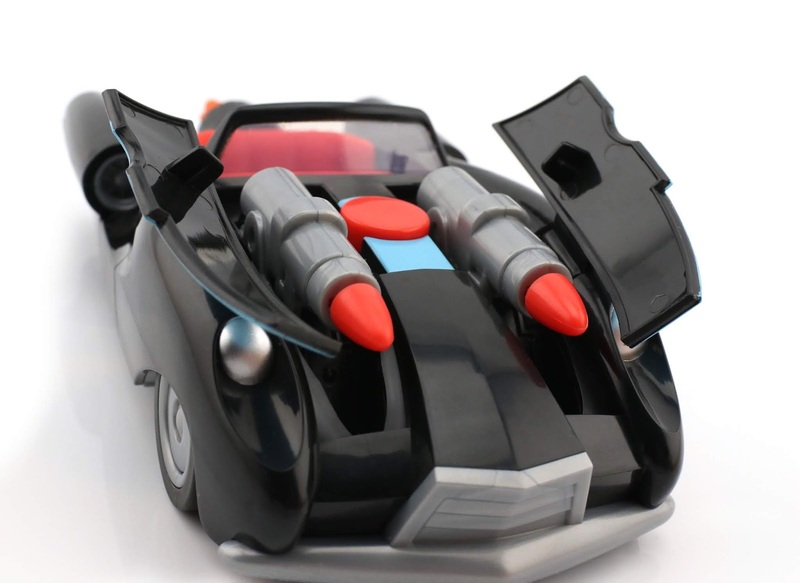 The two front panels on the car's hood will spring open and reveal two big guns with firing projectiles. Press the red circle button on the hood to LAUNCH! See it in action in THIS brief official Jakks Toys YouTube video! The Incredibile measures about 8" long, 3.5" wide and 2" tall. The Mr. Incredible figure measures 3" tall. 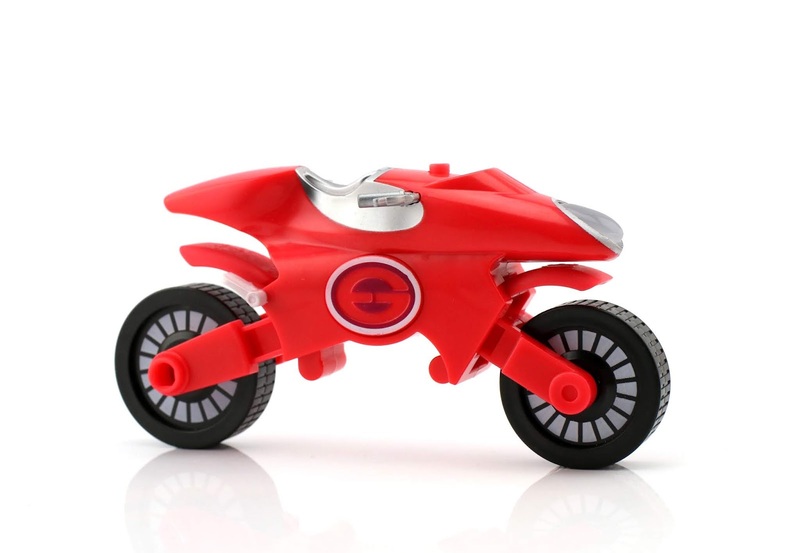 Kids can roll around the sleek Elasticycle to recreate the exciting, fast paced motorcycle chase as seen in the film! 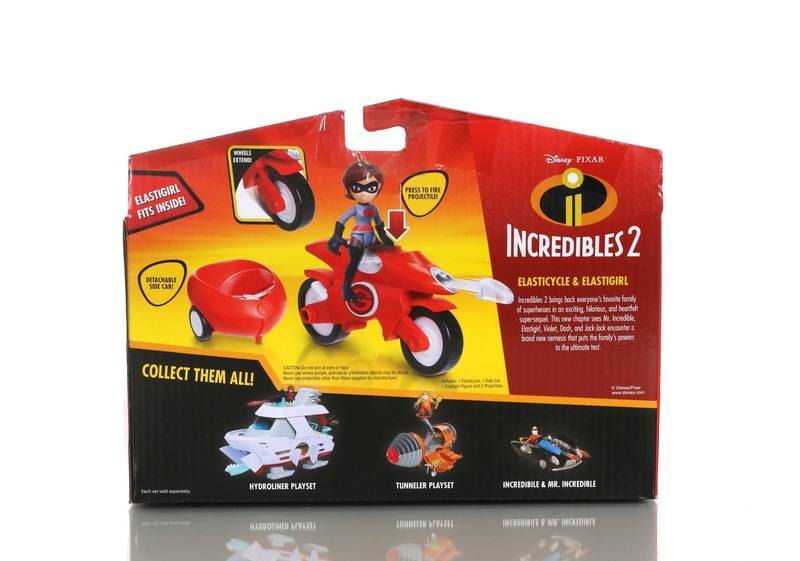 The Jack-Jack figure (sold separately—the one in the package is cardboard) can be added to the side car (as shown in my pic below) and the side car can be completely detached. 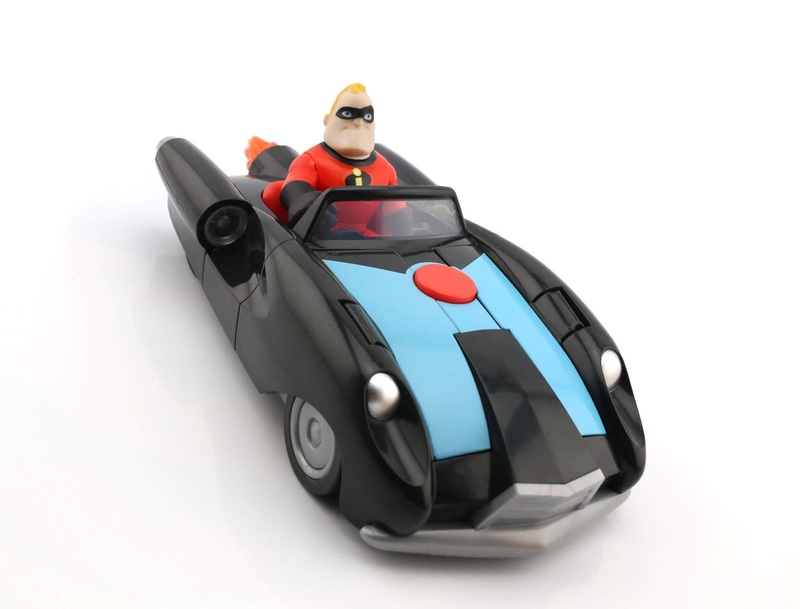 Press the button on the top of the vehicle to launch Elastigirl's missile. Two projectiles are included, though only one can be used at a time (a second one I suppose was added just in case one gets lost?). 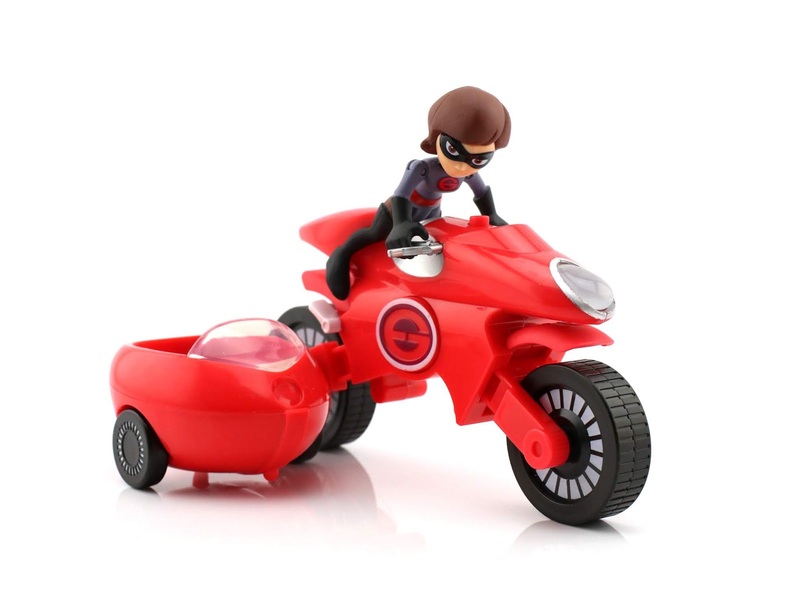 To make the back wheel "stretch" (extend), just press Elastigirl's "e" icon there on the side. Awesome! Again, see it in action in THIS official Jakks Toys YouTube video. The Elasticycle measures about 5.5" long and 3" tall. 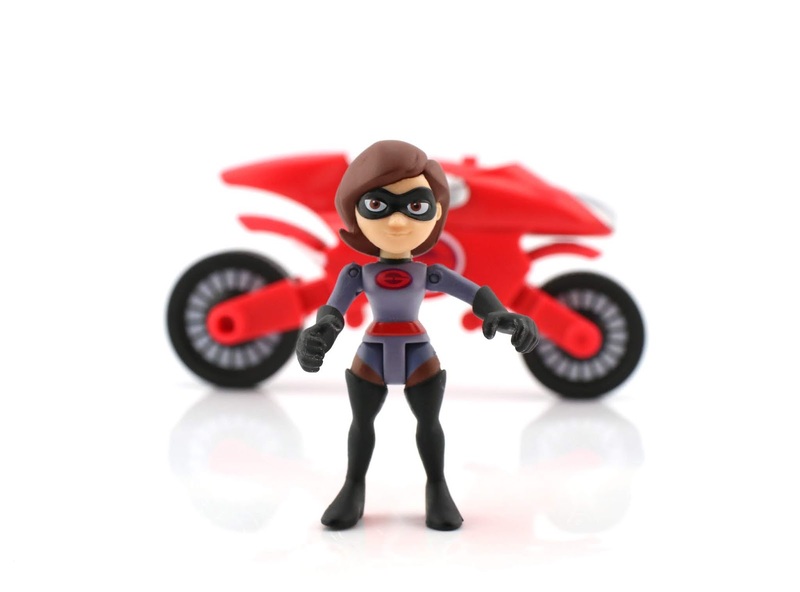 The Elastigirl figure is a little under 3" tall. The only tiny nitpick I have here is that the figures are 100% exactly the same as the figures I already got from the 2-Packs. Just a slight variation (even just a change in facial expression... or literally anything) would have been ok with me. I think figures included with playsets and vehicles should always be unique and exclusive versions, but alas. Other than that though, these things are seriously so cute and way fun! Retail for each vehicle set is $14.99. If you're already collecting the Junior Supers, these are must haves to take the fun up a notch. They can be found at Target (in the Imaginext isle) or on Amazon using the direct links below! 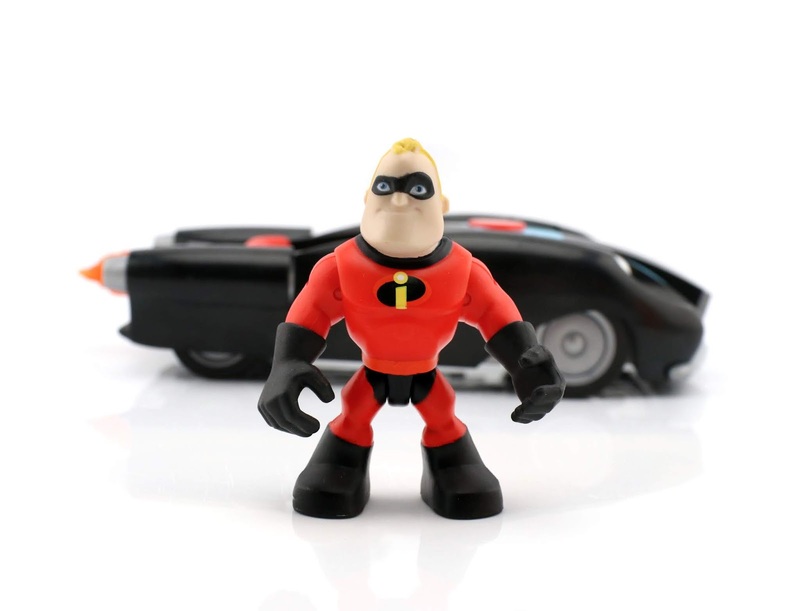 If you have an Incredibles fan at your home, you won't wanna miss out on these ones. Let me know your thoughts down in the comments. Another HUGE thanks to my friends over at Jakks Pacific for sending these over for me to review!